Check our interview with blonde bombshell Lisa Traugott who can be seen on FOX’s newest competition series “American Grit” hosted by WWE Superstar John Cena. 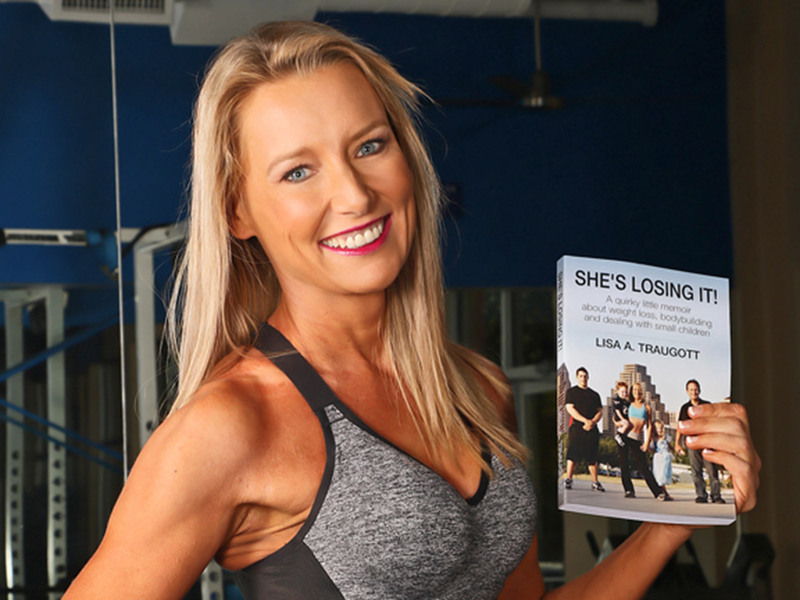 As a 41 year old mom of two, Lisa is now the author of 2 books: She’s Losing It! and Mind Your Manners Minnie Monster. She currently resides in Austin, Texas with her husband and 2 children and is getting ready to release a “30 Day Weight Loss Program” available through her website. Hi Lisa, please tell us a little about you? Thanks for talking with me today! I’m a 42 year old mom of two who likes to bodybuilding and blog. And flip houses with my husband, but that’s another story. My parents. I always wanted to make them proud. If I’m half as good a mom, as mine was to me, then my kids will be blessed. How and when did you start getting into fitness and bodybuilding? I’m a late bloomer. I never did sports; I was always picked last for the team in gym class. I mostly did exercise videos and yo-yo diets. After having kids I couldn’t shake the weight, my husband and I were having a rough patch and one day he said, “Lisa, I will always love you, but I’m just not attracted to you right now.” I was devastated. That same week my doctor told me I was borderline obese and I got an invitation to my 20th high school reunion. I felt like saying, “OK, I get the joke. Stop now.” But mostly I said, “Please God, fix me.” I took my final maternity check and bought 3 personal training sessions. It was there that I found out the fittest women in the gym were training for a bodybuilding competition. I had no idea women did that even, but I knew I wanted the results they had. So at age 38 and size 14, I entered a bikini competition. Five months later I lost 50 pounds and fixed my messy life in the process. I’m not one of those people who can just say, “I’m going to be healthy forever!” I need a goal to work towards, so I’m constantly doing bikini competitions, Spartan Runs and for my 40th birthday even tried a pole dance competition. That was pretty awesome. When the Statesman Social said my book “She’s Losing It!” was the “Best New Year/New You book” that felt great. Even more rewarding though, are the messages I get from women who say that they read my book and are now doing a 5k race, or started eating clean, or lifted weights for the first time. I really wanted to write this book and be on American Grit to be a “Rocky for Moms”. So many women look into the mirror and feel like their best days are behind them; they wonder who that frumpy middle aged woman looking back at them, did with the true woman they used to be. I want to let women know that change is possible. If I can do it, hell yeah, they can too. I’ve lost the weight and kept it off for four years now. On my website ShesLosingIt.com I’m giving away a free e-book called “Mental Strength – Overcoming Obstacles in Weight Loss” where I talk about what it takes to actually KEEP the weight off. Just sign up for the newsletter and I’ll send you the book for free. I wake up at 3am to do fasted cardio until 4am. Then I shower, eat and do my strength training at 5am. By 6am I’m done and can do regular mom stuff like laundry and procrastinating doing my office work. I love bison. Who knew? Tell us about your experience in the new FOX’s newest competition series “American Grit”? Second only to the birth of my children, it was the most life altering experience I went through. I was pushed physically, mentally and emotionally past all sorts of limits and I got to do things that I never imagined a 42 year old mom would do. I got to do a whiskey shot with John Cena! I carried a 120 pound lot 3.6 miles through the snowy forest with a lumberjack, Olympic gold medalist and Alaskan fisherwoman. Seriously, my status as coolest PTO mom in Pflugerville, Texas is forever sealed. What the show is about? It follows 16 civilians as we do military-style training exercises called evolutions. We are divided into 4 teams and lead by real-life elite military heroes called the cadre. My cadre is Noah Galloway, a purple heart recipient. The team that wins the evolution gets immunity and the other three teams have to send in a member to face the circus, an obstacle course followed by an endurance competition that continues until someone’s body gives out. Last year was really hard. My mother was diagnosed with end-stage lung cancer, so I helped her move from NJ in with my family. At the airport she tripped over my daughter’s suitcase and hurt her hip, so she needed a walker. I took her to chemo and physical therapy and it was the worst thing to watch someone you love slowly die. Just as my book “She’s Losing It!” was being released, I started to gain some of the weight back from stress eating. I refused to do that again, so I found a new trainer (my original trainer moved to Houston), named Robin Johnson Jr. I needed a huge goal so I applied to the Arnold Classic, the 2nd largest international bodybuilding competition in the world. At the time I did not have an award winning physique (I just did competitions for fun) but I did write a really good cover letter and got in. I blogged about everything. Even though I was competing against women literally half my age, I came in 20th out of 38. My mom told me she had a dream that I would win 3rd place. 5 weeks later I did the Texas Shredder and won 3rd place. My mom died two weeks later. To deal with my grief and not slip into emotional eating, I just kept competing…and winning. 3rd place, then 2nd, then finally 1st place! The casting director from American Grit had been following my blog and asked me to audition. I didn’t think I was qualified, but they thought I could do it. I found out later that 6,500 people applied for the show, and I was one of 8 women to get cast. I was dumbfounded. Is John Cena as tough as he looks? Yeah. You know how some people eat steel cut oats? He eats steel for breakfast. Actually, he’s a really cool guy, very funny and personable. I very much felt like he was rooting for each of us to win. What music can we find in your iPod? I’m eclectic from Frozen’s “Let It Go” to old school Tupac. Sometimes a mommy just needs her gansta rap. We make a nice pot of coffee, I cook up egg whites and oatmeal and then my husband and I watch Meet the Press to see what crazy things Donald Trump said this week. Then we pile the kids in the car and go to church. When we come back we just hang out, you know? Maybe play in the park or watch HDTV if it’s raining. In the past I’ve raised close to $100k over several years for Team In Training/The Leukemia & Lymphoma Society. I’ve also been an ambassador for the American Cancer Society to promote anti-smoking legislation. Right now I’m having weekly American Grit watch parties at Hangovers in Pflugerville and proceeds from the drink special “The Green Machine” are going to my cadre’s charity the No Excuses Charitable Fund. My smart phone, car keys and sugar-free gum so I don’t chew my arm off. Sometimes I think the “F” in Facebook stands for “FU Lisa”. They shut me down for two days because they said that MY OWN before/after pictures were “unlikely”. For the premiere I had to figure out how to live tweet, which was harder than carrying a tent through icy waters and then solving a puzzle. I’m not totally sure how to tag people in Instagram, and only just recently found out what bae means. And don’t get me started on the clusterf*** that is Google Hangouts. Travel destination: For the love of God, let it be somewhere warm and with a beach. Quote: “WHERE. ARE. MY DRAGONS!? !” Sorry, still thinking #GOT. For an inspirational quote I like, “Do what you can, with what you have, where you are” – Theodore Roosevelt. To me that means that you will never have completely perfect conditions, but you must act anyway. Book: “To Kill A Mockingbird” touched my heart, Tina Fey’s “Bossypants” tickled my soul and “Die Broke” changed my entire perception about money.